Onto the final two drama ceremonies of the year! 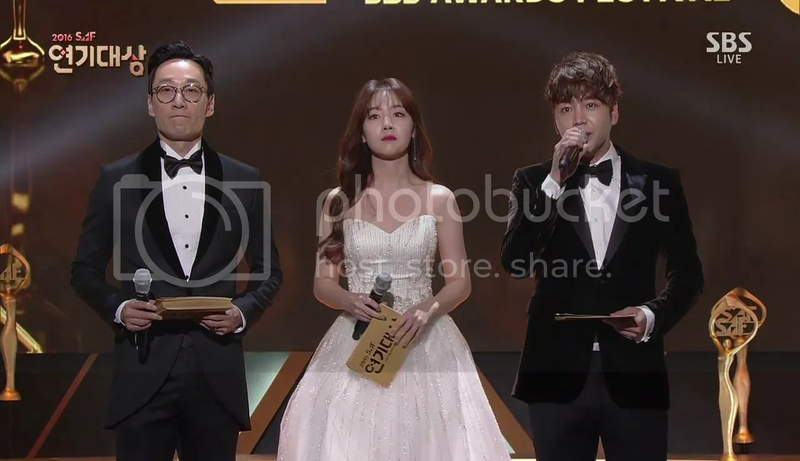 The red carpet MCs were Boom and Jung Chaeyon of IOI fame, while the MCs on stage were Lee Hwi Jae, Minah from Girls’ Day, and Jang Geunsuk. Sadly, there wasn’t much of a focus on red carpet interviews. Some stars merely said a few sentences. 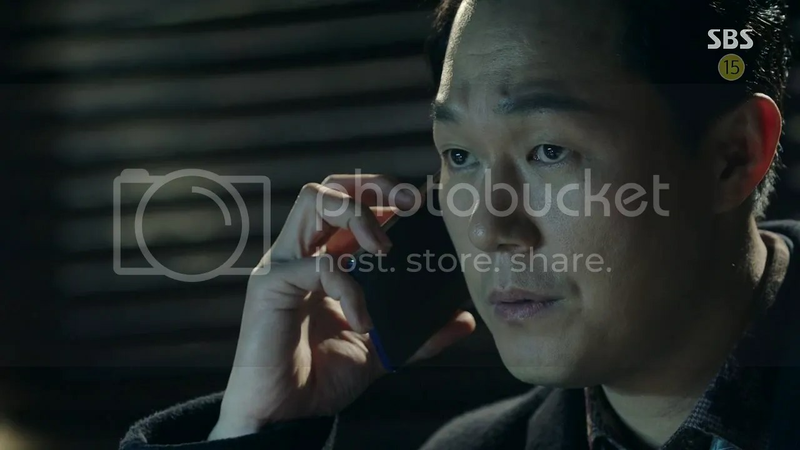 Park Sungwoong hoped Jo Jungseok would sin the Daesang. Namgoong Min gave a shout out to his Beautiful Gongshim co-star (and MC of the night) Minah saying that he’ll be looking forward to their MCing. Seohyun and Jun Hyosung danced about on the red carpet. 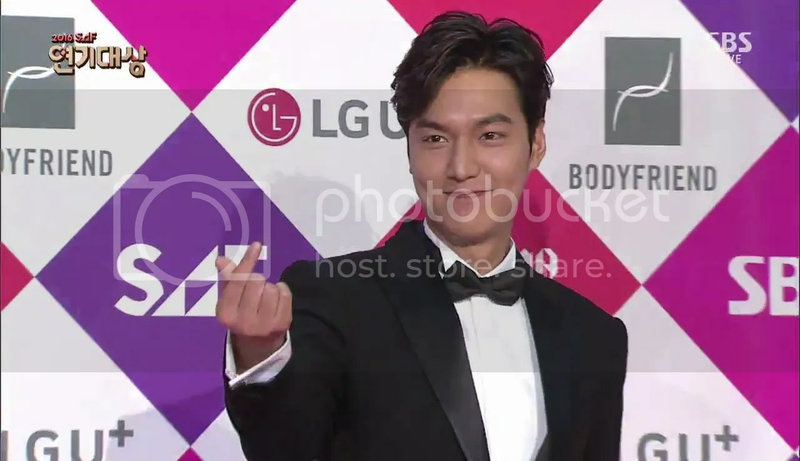 Yoo Seungho gave a smolder on the red carpet and Lee Minho shot finger hearts everywhere. In Ah informs Jinwoo that Il Ho’s private helicopter has requested clearance for flight. He speeds over in time to catch Gyuman before he boards. Events proceed as they did the previous episode and Gyuman finds himself in an interrogation room with In Ah. In Ah introduces herself as the prosecutor in charge of Gyuman’s case. Moosuk demands answers from Tak Youngjin who smirks and says that they were the ones who wanted him to switch prosecutors. Nam Il Ho’s surprisingly slow as he continues to ask Youngjin just what the meaning of this is. In Ah answers. We begin at the trial with Jinwoo stammering that Dongho didn’t kill Oh Jungah. Seokgyu gives him a long searching look while Jinwoo stares blankly about him. He announces that the court is adjourned and Jinwoo comes back to reality, leaning against his desk while In Ah cries and Dongho stares. 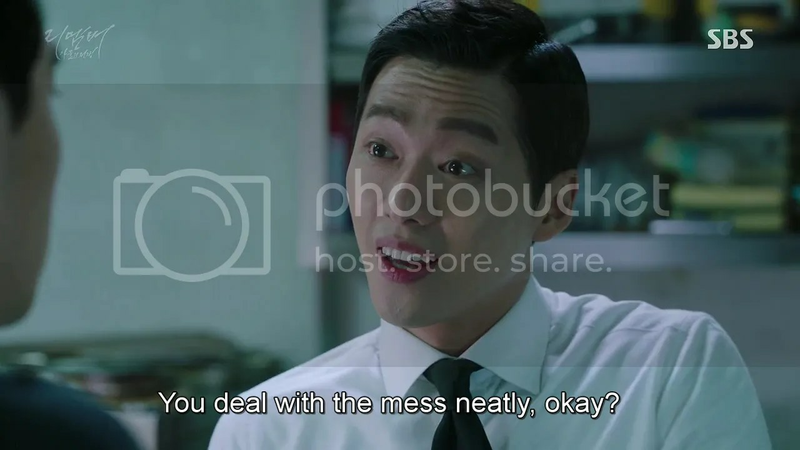 We begin with Donghogoing through paperwork in his office when he gets a call. Sangho informs him of Seok Joo Il’s critical condition. We flashback a bit to when Gyuman unintentionally managed to evade Lawyer Song’s recording pen and place a call to Soobum. He waits in the kitchen until Soobum arrives and exchanges jackets with him upon receiving reassurance that his getaway car is parked by a side door. In Ah hugs Jinwoo and weeps while he just stands there looking confused, unsure of whether to hug her back. (What I thought was awareness of the situation returning, yesterday, was just his awkwardness). He stays at his former house, still wondering what’s going on, while In Ah returns to the office and asks Lawyer Yeon for the truth.